Our scholars attend mass weekly and pray daily. From weekly mass to daily prayer, faith is a constant at St. Peter Claver School. While we are a Catholic School, we welcome and respect people of all faiths. In fact, two-thirds of our scholars are not Catholic. We begin each week with a prayer service; scripture readings set the tone for the week. Every day during morning announcements, scholars and staff recite a prayer together. Religion is taught as part of the curriculum, and our Top 20 Program of social-emotional learning is incorporated in those lessons. Our chaplain, Fr. 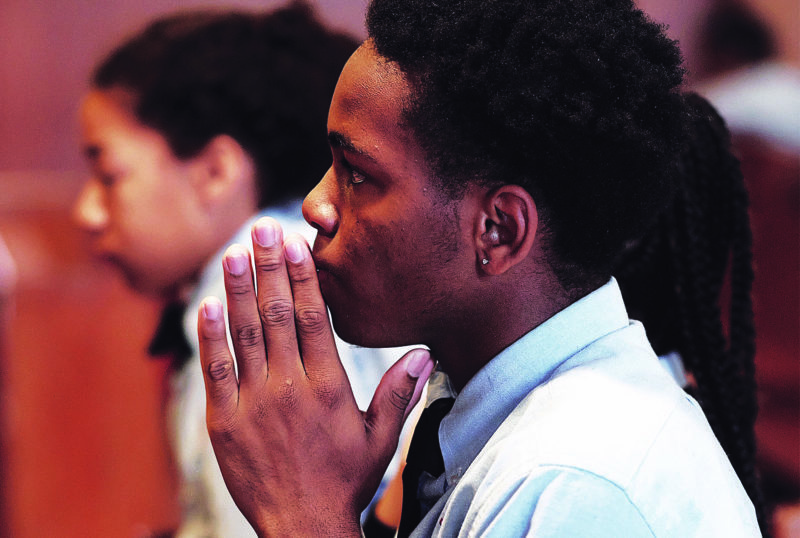 Erich Rutten, pastor of St. Peter Claver Catholic Church, says all-school mass every week. During mass, Fr. Erich explains the rituals and invites those of all faiths to participate. Our 8th graders pair up with a kindergartner for mass, which makes for relationships that last for the entire school year. They take the youngest ones under their wings and share what they have learned in their time at our school. The Top 20 Program encourages social-emotional learning and teaches skills scholars will use their whole lives. All are welcome to join us for mass at St. Peter Claver Church; we celebrate mass on all school Fridays at 8:15 a.m.